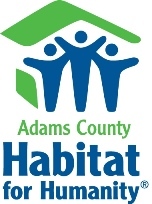 Affiliate chapters such as Adams County Habitat for Humanity build and repair houses all over the world using volunteer labor and donations. We do not give away houses. Habitat is about providing an opportunity for families who need a helping hand. The opportunity to obtain a house with a no-interest loan is an amazing opportunity. Other organization, such as USDA’s loan programs, fulfill different needs for families. Habitat strives to reach hard-working, low to moderate income families who might not qualify for conventional programs. By applying and becoming successful Habitat homeowners, families build a foundation of good credit and establish ties within Adams County communities.